Anthony was born in China in 1947. 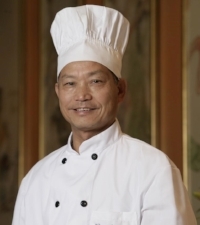 At the age of 15, he left his hometown of Foshan to work in Hong Kong as a chef, following his father’s footsteps. Within 1 year, Anthony had started a 4 year apprenticeship with is father, after which he moved on and worked in various other restaurants. In 1972, Anthony became the Head Chef at Kam Fai restaurant. It was here that his work had caught the eye of Gilbert Lau, then owner of Flower Drum Restaurant. It was he that enticed Anthony to move himself and his family to Melbourne to take up the position of sous chef in 1980. When Flower Drum changed locations from Little Bourke St to its current location of Market Lane in 1985, Anthony had moved up to the position of Executive Chef, and has held the position since. By the end of December 2002, Anthony took over the Flower Drum with 2 other long serving colleagues from Mr. Gilbert Lau. It was then that his 2 sons, Jason and Victor also started working at the Flower Drum and continue to do so today. Under Gilbert’s leadership, the Flower Drum has demonstrated that Chinese cuisine can provide dining experiences equal to that of great European cuisines. Anthony combines traditional cooking methods with the best of ingredients. After 40 years in the restaurant business Anthony has honed his instincts to near perfection and, as a result, his work exemplifies all that is best in modern Chinese cuisine. Anthony regularly goes back to Hong Kong and China to keep up with the latest ideas and in search of new or old recipes and approaches to food preparation. This is to ensure that the Flower Drum continues to provide the highest quality of not only traditional and authentic dishes, but also new flavours to its patrons.